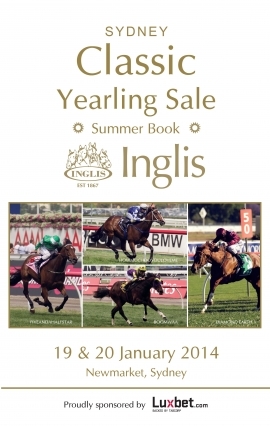 The first Sydney 2014 yearling sale catalogue is now available for viewing online. The Inglis Sydney Classic Yearling Sale – Summer Book to be held January 19 & 20 will offer buyers 480 yearlings across two days at Newmarket with a starting time each day of 10am. Renowned for its outstanding value, Inglis Classic continues to produce top class Group 1 winning thoroughbreds, which all too often achieve heights far greater than their price tag may suggest. Group 1 graduates Fiveandahalfstar, Sincero and Secret Admirer highlight some of the sale’s tremendous racetrack performances. I’m All The Talk, Everage, Boss Lane and Va Pensiero have all rewarded their owners winning stakes races on Sydney tracks over the last 12 months. Silversands and Boomwaa, both graduates from Classic 2013, have already handsomely repaid their owners winning the $250,000 RL Inglis Banner on Cox Plate Day and the Group 3 Maribyrnong Plate on Emirates Stakes Day respectively. The sale sire ranks continue to strengthen with the likes of proven stallions Magic Albert (16) and Not A Single Doubt (12) joined in 2014 by highly promising second crop stallions I Am Invincible (22) and Denman (8). Progeny of first crop stallions to be unveiled to the public include a distinct element of colonial two-year-old speed with Beneteau (13), Star Witness (13), Tickets (12) and Hinchinbrook (8) all well represented. Only yearlings offered at the 2014 Classic Summer and Winter Books will be eligible for the $250,000 RL Inglis Classic held at Rosehill in January 2015 as part of the $5 million Inglis Race Series. No serious racehorse buyer can afford to miss the Classic Summer Book at Newmarket in January 2014.